I am an early riser, and I had finished my breakfast, brushed my teeth, and was on the way out the door of my Fairfax townhouse, when the telephone call from Stockholm came at 6:32 a.m. on 16 October 1986. My schedule called for a half-day’s work at George Mason University before driving down the Shenandoah Valley in October’s colorful splendor to my country place, tucked deep in Virginia’s Applachians. My wife, Ann, had been at the country place all summer; we had not yet made the semi-annual, quasi-move from the country place to Washington’s suburbia, a move that we delay each year as long as possible. The telephone call changed all such plans. I called Ann, then Betty Tillman, my long time girl Friday, and escaped from the townhouse after only one other call, from CBS morning news. On arrival at the office, shortly before 7 a.m., it was already abundantly clear that 16 October would not be an ordinary day. Representatives from the print, sight, and sound media had commenced to arrive, and the parking lot was soon filled with sending towers and dishes. The phones went wild, and Betty rounded up all of the building’s clerical staff, plus graduate students as they arrived, for assistance. Helen Ackerman, the university’s public relations director, arrived to help with press contacts. We hastily organized a news conference for 11 a.m., which went on for an hour with perhaps one hundred in attendance. 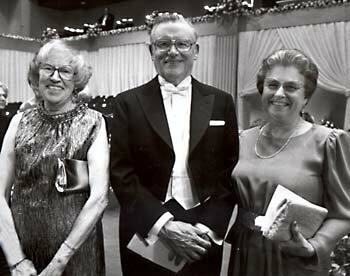 After the Prize Award Ceremony, Professor James McGill Buchanan poses with his wife Mrs. Ann Backe Buchanan and his administrative assistant Mrs. Betty Tillman (right in photo). In part this unexpected concentration of attention on my selection for the Nobel award was temporal and locational. Congress was not in session, and the Iran-Contra scandal was bubbling just beneath the surface of exposure. The Washington suburb, Fairfax City, is only a half-hour from the district. I was “the news” of the day, and quite in contrast with Robert Solow, who, a year later, was named as the 1987 Nobel Memorial Prize recipient on the day after Black Monday. Basically, the early releases were informationally accurate and largely biographical. Who is James Buchanan? Where and what is George Mason University? What is public choice? Perhaps I responded too quickly to the last of these questions, and perhaps in my eagerness to be understood I jumped too readily into the application of public choice analysis to the budget deficit. As a result, all sophistication in evaluation was lost, and the secondary journalistic accounts that appeared in the days immediately after 16 October were simplistic, grossly misleading, and could have been taken to be insulting to me, personally. Alone with most of the other Nobel laureates in economics, my selection was ridiculed by the media ignoramuses, in my case on the grounds that any fool knows that public choosers seek to promote their own interests. This type of criticism, stemming from uninformed journalistic arrogance, is unique to economics, and it is a cross that we bear in a science that has never isolated itself sufficiently from the public discourse. Every man his own economist – this has proved to be the scourge of rational public discourse for the lifetime of political economy. Tertiary accounts, both positive and negative, that appeared in the weeklies and monthlies were more thoughtful, since these accounts were written by journalists who made at least some effort to understand the award by reading my books rather than the reports of other journalists. It was apparent, very soon after 16 October, that, had I chosen to do so, I could have “enjoyed” widespread media exposure on the Washington-based talk shows that are centered on economic and political events. My very early reactions were surely the correct ones. Aside from a first-day appearance on the McNeil-Lehrer PBS news hour, I turned down all invitations for television, radio and guest column slots. I am not a policy analyst, and my views on current issues should carry little more weight than those of anyone else. I was determined not to become an “instant expert” on everything merely because I had achieved the notoriety of the Nobel Memorial Prize. A full day did not pass before I came to realize that my selection was special in its own way, and unrelated to me in a directly personal sense. As I suggested earlier, I had never entertained a prospect of Nobel Prize status, despite considerable academic acclaim, because I held myself, my work, and my affiliation, to be too far outside the mainstream both of my own discipline and the American academia. (And I know that I should have never been selected for such an award had the selection committee been drawn senior American economists!) But this very distance from the central thrusts in subject matter, research method, ideology, institutional affiliation, regional location, and personal history also insured that, once the distinguished Swedish committee chose me for the Nobel award, I would become, in a real sense, “representative” for all members of the several intersecting sets of scholars and students. As I stated in my return to a celebration in my honor in Tennessee in early 1988, “if Jim Buchanan can be selected for a Nobel Prize, anyone can.” And I felt that this sentiment was indirectly expressed in the hundreds of calls, telegrams, and letters of congratulations that poured into Fairfax from all corners of the globe during those weeks in late 1986. In a sense, I do embody something of the American myth of social mobility. For how many farm boys from Middle Tennessee, educated in tiny, poor, and rural public schools, and at a struggling state-financed teachers college, have received Nobel prizes? How many scholars who have worked almost exclusively at southern universities have done so, in any scientific discipline? How many of my economist peers who are laureates have eschewed the use of both formal mathematical techniques and the extended resort to empirical testing? I was not, of course, surprised at all by the outpouring of congratulations from my research peers in public choice, with whom I had worked variously for decades. As I emphasized at the first day’s press conference, I recognized that I did represent this whole group. There was no single or unique contribution attributable to me, alone, that provided the basis for the committee’s action. The award was, I think correctly, bestowed in recognition of an important research program in political economy, a program that involved many participants, including many colleagues, students, and coauthors. I was presumably signaled out as representative because of the extended period of my research concentration, the leadership role that I had assumed, and the increasing emphasis on the constitutional implications of the program, implications that I have always particularly stressed. The good wishes of so many warmed my heart, but these messages were accompanied by a surprisingly large number of calls, telegrams, and letters from the world’s self-proclaimed saviors. I had encountered the occasional kook previously, but the Nobel Prize announcement offered a focus upon which many more could direct their efforts at persuasion. Boxes piled high with pleas; if I would only endorse this or that scheme (economic, military, moral, philosophical, political, or religious) the world would surely come right. And these pleas covered the whole spectrum of rationality, ranging from the ravings of the near-insane to the entirely plausible petitions of sincerely devoted rational-if-romantic reformers. Once again, and early, I imposed an internal rule for my own behavioral responses. The notoriety of “Nobelity” did not elevate me to the peaks of wisdom, and a pronouncement by me or any other laureate, or any collection of laureates, should command no more respect than pronouncements by anyone else. I resolved to abjure all invitations, whether for signatures of support, or for participation in congresses, conferences, or meetings that carried the aura of Nobel-identified intellectual-scientific elitism. This resolution was surely inspired, in part, by my observations of the common folly of scholars and scientists who pretend to be wise beyond their own borders. George Stigler, the Nobel Laureate in Economics Sciences in 1982, told me shortly after my own award was announced that the event would disrupt my life for six months, but, after such an interim, things would return more or less to normalcy. With me, the period was two years, rather than six months. The years 1987 and 1988 were the “busiest” of my life, if “busyness” is measured by external lectures, talks, seminars, conferences, and miles traveled. And the opportunity costs were measured in the papers and chapters in books that did not get written, and more seriously, the ideas that may have emerged but which now may never reach my consciousness. The economist in me recognized that the post-Nobel increase in demand for my services need not have increased my amount supplied, and that fully rational choice behavior on my part should have enabled me to control my own schedule more adequately than I did. But why does an individual’s supply schedule slope upward? Why did I accept more lecture commitments as the honoraria and fees moved substantially upward after the Nobel notoriety? Surely, I did not “need” the added income. I have no children to ruin by passing on a larger personal fortune; I do not get my kicks from larger personal payments to the Internal Revenue Service. Did I, subconsciously, recognize that my normative message had become, due to the Nobel-induced attention, more respectable, and hence, that I could, at least indirectly, now exert more ultimate influence on public opinion? In this case, the higher fees would have been non-causal in my behavior. But I have long classified myself as lacking, the didactic urge. I have, with reasonable consistency, eschewed the role of either preacher or prophet. Was I deceiving myself? Did I really seek to save the world after all? I do not think I have been trapped in such self-deception. I think, instead, that my personal supply schedule slopes upward for the standard pecuniary reasons. As Lord Bauer suggested to me when we talked about this point in late 1988, “one can never escape from one’s own shadow.” Past experience describes who I am, and through almost all of my experience income, as such, did matter. And an ingrained pattern of supply response did not suddenly vanish due to modified pecuniary circumstances that the Nobel Prize award insured. In a very real sense, the two years measure the time it took for me to begin to respond rationally to demands in my modified environmental setting. Perhaps George Stigler was simply a more rapid learner, or, perhaps, he was burdened less by an impecunious past. But let me be honest with myself. There is another aspect of my behavior on the lecture circuit that does carry positive value in my preference function, over and beyond either pecuniary emolument or ultimate ideological purpose. I enjoy the “performance itself, within limits, and given the appropriate setting. I enjoy the sense of command over and upon the attention of others; the actor that is deep inside all professors-teachers emerges to make me “feel good,” to charge me up. And, so far as I can sense it, this positive feedback is largely unconnected with the subject matter of the argument and with the fee that I am being paid. And it is this utility value that, at least in some part, determines the direction of my response to varying forms of invitation. I know the type of audience that works best for me, and I tend to be more receptive to the predicted audience and to the environmental setting for presentation than I am to the fee or to any anticipated ultimate influence on opinion. 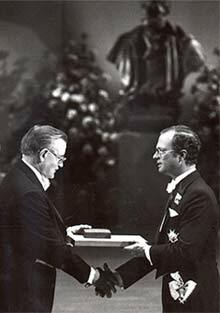 Professor James Buchanan receives his award from the hands of His Majesty King Carl Gustaf of Sweden at the Stockholm Concert Hall. The direction of response here is related to the “social distance” aspect of my Nobel award. I am perceived, and widely so, as the only Nobel prize representative of the “great unwashed” in American academia, those thousands of faculty members and students who spend their lives in the public and private colleges and universities of our land without the prestige value of intellectual-scientific, and social, ranking. I am of the non-elite, from which it follows, more or less as a matter of course, that I get my warmest and surely my most wholesome reception during those visits to the academical villages, south, north, east, or west, that rarely see a Nobel prize winner, and whose members hold potential “Nobelity” to be beyond their aspiration levels. In these settings, what I actually say in my lectures, seminars, postmeal talks, and informal discussions is much less important than the fact that I am there as a Nobel prize winner. But, as noted, to these particular audiences, I am a larger-than-life Nobel laureate, because I have emerged successfully from an academic background and environment that members recognize to be analogous to their own. The very deep populist elements in my psyche are stirred by the direct feedbacks of my appearances in these settings. So, when I do a summary reckoning, perhaps the utility accounts are not so askew as they may seem when first examined. But two years was, for me, a time sufficient to enjoy the one-time plaudits of my genuine “fans.” This part of “my show” surely ended with 1988. I have never been tempted to make pronouncements on this or that policy issue. Hence, the fact that any statements on my part will, post-Nobel, necessarily, be more worthy of public notice need exert no feedback influence on my behavior. The “responsibility of Nobelity” in any direct sense of the term is surely among the least of my concerns. But there is an aspect such responsibility does raise issues of personal morality. I suggested that I have never felt an urge to save the world or, indeed, to treat myself to be more responsible in a civic sense than any other person. On the other hand, I also recognize that unless someone, somewhere, takes the lead in promulgating constitutionalist ideas that are inherently “public,” then we could scarcely expect such ideas to enter into public consciousness. We shall not secure the social order that is within the realm of the possible if each of us sits by and waits for the process of social evolution to work its will. There is, for me, a categorical distinction to be made between the presumptive arrogance of anyone, Nobel laureate or anyone else, who takes it on himself to tell others what they should do, and the attitude of someone who actively enters as a participant in a discussion of social change with all persons treated as reciprocating contributors. The second of these roles does not, and cannot, be motivated directly by simple self-interest. There is little or no personally identifiable interest to be furthered in attempts to persuade other persons to agree to multi-person political “trades” that involve changing, the rules by which we live together in a polity. Some ethic of constitutional responsibility is required here, some interest that extends beyond that which is of measured utility value directly to me, and which is, at the same time, something other than the single-minded pursuit of “truth” which describes the idealized ethical norm for the natural scientist. At least some of the players in the inclusive social game must attend to the rules that define the game, the constitution of order, and such attention does not emerge from private self-interest, at least directly, or from “scientific discovery,” as such. Within limits, we make our own rules for living together. And this central presupposition of the constitutionalist carries with it the implied ethical principle that dictate attention to the workings of the social order. How does acceptance of this presupposition and this principle affect my own behavior in the aftermath of short-term “Nobelity?” Precisely because I am the only constitutional political economist that has achieved or seems likely to achieve Nobel Prize status, do I not carry on my shoulders the particular “burden” for all would-be constitutionalists? In a sense, I surely must do so. And the acknowledgement of this fact alone offers me the incentive to put off the obscenity of retirement as long as proves to be physically possible. Recognition of my uniqueness along this constitutionalist dimension of interest shapes the direction and content of my projected efforts in the 1990s. those who are members of the academies. My own experience, both pre- and post-Nobel, tells me that ideas do have consequences. But far too many of my peers in the social sciences and philosophy concern themselves too much with normatively defined consequences while neglecting the task of reinforcing, maintaining, and sometimes originating, the ideas without which consequences lose all moorings. A decade has gone by since the preceding sections of this essay were written, and the dated sense of the material comes through in several places. There is, however, relatively little that should change if given an opportunity for a thorough re-writing. The world has, of course, dramatically changed over the decade. The essay was written before the full impact of the revolutionary events in central and eastern Europe was recognized or predicted. The 1990s are years of post-Cold War, with implications that are not yet fully understood. 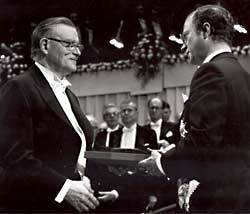 The bust of Alfred Nobel is seen in the background as Professor Buchanan receives his diploma and medal from His Majesty King Carl XVI Gustaf of Sweden. The arguments developed in the immediately preceding section now seem more important than they did a decade earlier. I am deeply concerned about the apparent apathy of citizens everywhere, about the absence of outrage at the sometimes petty intrusions of governments into our lives, about the failure to appreciate developing crises in welfare democracies. Most fundamentally, I am disturbed by an apparent public failure to appreciate and to understand the relationships between the constitutional structure that defines the parameters of social-economic-political life and the patterns of outcomes that we observe. In the new century, more than ever, we must attend to the rules of the game. * A more extended version of this paper was published as Chapter II in my Better than Plowing: And Other Personal Essays (Chicago: University of Chicago Press, 1992).